INDUSTRY.co.id - Jakarta, This week became the long-awaited automotive lovers. From start to chase new car, to find product of complementary accessories of its vehicle, and society also ready to wait Indonesian Indonesian Motor Show (IIMS) 2018 is started. All automotive brands and accessories are ready to present their superior products only to you, IIMS 2018 visitors. This time Asuka also will not miss the opportunity to introduce new products. The lifestyle of modern society is increasingly dependent on the existence of gadgets that are very felt once, especially Smartphone. Almost in everyday activities one is always attached to this sophisticated technology product, because with such a small item is able to complete many jobs and connect with many people at one time. While driving too many people remain active with this beloved goods, but it is very dangerous because it can cause accidents. But it can now be addressed with the presence of ASUKA ie A-CAST Smartphone Mirroring Box. ASUKA always innovate in delivering the latest products that can help the users of vehicles, especially cars in daily routine. Smartphone Mirroring itself is a product that allows car users in accessing the Smartphone while driving. With this powerful tool, users who want to do Smartphone-Mirroring to Head of car unit, can do easily even though Head unit in your car do not yet have Mirroring feature of Smartphone. Pressure to increase productivity teases many people to continue using the phone, even when we are behind the wheel. Ironically, even though almost all drivers know that driving while holding the phone in hand is not safe, but still done, usually when viewing the navigation application. Similarly, other passengers in the vehicle who often want to enjoy video or music in the vehicle but constrained by the small screen Smartphone and sound effects are limited from the Smartphone. The solution to the problem is using A-CAST Smartphone Mirroring Box. A-CAST is specially designed for use in the car to be more comfortable when driving because it can see the display screen Smartphone on the screen Head unit such as Youtube show, Navigation, watching movies, listening to favorite music and other features available in your Smartphone. So by using A-CAST the driver can drive without having to tightly clutch the Smartphone and also help passengers become more comfortable while accessing the desired entertainment. Smartphones that are currently circulating and owned by many people have an operating system to activate it. Quite a lot of operating systems used on Smartphone but the most commonly used is Android and iOS. ASUKA A-CAST Smartphone Mirroring Box can accommodate Smartphone users who use the Android operating system or iOs. As for the output is available with a choice of HDMI and RCA ports. Acast itself is designed specifically for use in the car. Many dongles on the market today are not actually designed for use in cars, but for home TV use, which tend to have electrical conditions, more stable temperatures, and no moving. Acast has been better tested in connection and durability for use in cars that have more extreme conditions. 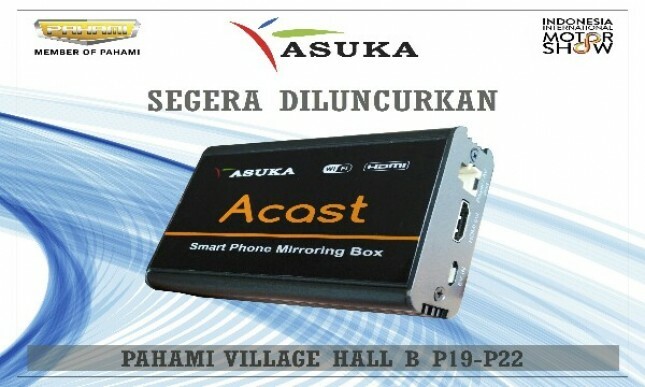 Asuka itself provides 2 years warranty for this Acast product. In addition, Smartphone users also do not have to worry about the smartphone OS that often updates regularly, because along with it Acast can also update Over The Air (OTA), so it will always be compatible with the user's Smartphone. So complete your favorite car now with ASUKA A-CAST Smartphone Mirroring Box to drive more comfortable and more focus without hands must continue to be busy holding the Smartphone while driving on the road.